multifoci lobular carcinoma grade III. Researchers from the Athens University Medical School and Alexandra General Hospital in Athens, Greece, are proposing the use of a malignancy potential score (MPS)---a combination of a standard BIRADS score combined with a four-point contrast-enhanced spectral mammography (CESM) score---to help increase the accuracy of early breast cancer diagnosis. They describe their use and validation of the MPS in an article published in the British Journal of Radiology. Two-hundred-sixteen women with 226 suspicious lesions identified by screening or diagnostic mammography had a CESM exam in which a commercial digital mammography system modified to shape the X-ray spectrum for CESM was used. The procedure took an average of seven minutes. First, an iodinated contrast agent was administered using an automatic power injector. A pair of low- and high-energy craniocaudal (CC) images were acquired in the normal breast, followed by CC and mediolateral oblique (MLO) views of the breast with lesions, and then by an MLO view of the normal breast. Iodine-enhanced images were created from the combination of low- and high-energy images. When added to the B-RADS score of 3 to 5, the MPS ranged from 2 to 7. The study showed that an MPS score greater than 4 indicated a strong probability of a malignant lesion. Pathology-confirmed biopsies identified 98 (43%) malignant lesions and 128 benign lesions in the patient cohort. Ninety of the malignant lesions (91.8%) had an MPS score greater than 4. Eighty percent of all benign lesions had an MPS score equal to or less than 4. Most (85.5%) Type 2 enhancement lesions were ductal carcinoma in situ (DCIS), invasive ductal and lobular carcinoma, and tubular carcinomas. Twelve lesions in this category were benign, 83% of which were fibrocystic changes. Only 45% of Type 1 enhancement lesions were cancerous. Most benign lesions were fibroadenomas or fibrocystic changes. No lesions categorized as Type -1 were malignant. However, six of the 93 lesions in the Type 0 category, or 6.4% were malignant, either DCIS (4) or invasive ductal carcinoma (2). In this study, CESM had a higher diagnostic accuracy rate (80.97%) than digital mammography at 73.89%. The MPS score produced an even higher rate of 85.4%, and also outperformed each in specificity, with MPS at 80.4%, CESM at 71.31%, and mammography at 59.37%. “MPS empowers the credibility of the digital mammography BIRADS score and our proposed type of enhancement in dual-energy CESM,” the authors wrote. They recommend that additional studies with larger patient cohorts be performed to further validate their findings. Tsigginou A, Gkali C, Chalazonits A, et al. 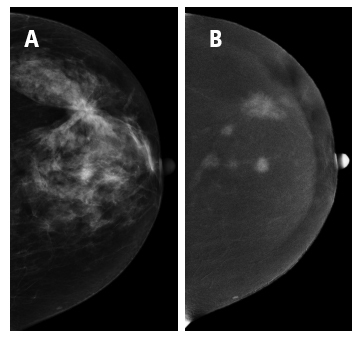 Adding the power of iodinated contrast media to the credibility of mammography in breast cancer diagnosis. Br J Radiol. 2016 89: 20160397. BIRADS + CESM = Higher BC detection . Appl Radiol.